Objective/Method: A group of 4-benzoyl-1-dichlorobenzoylthiosemicarbazides endowed with antibacterial activity was evaluated for its cytotoxic properties against breast cancer cells (MCF-7, MDA-MB-231) and head and neck squamous cell carcinomas (FaDu, SCC-25). Cytotoxicity of the investigated compounds was measured using MTT and [3H]-thymidine incorporation bioassays. Result: 1-(2,3-Dichlorobenzoyl)-4-(2-methylbenzoyl)thiosemicarbazide (TA-4), 1-(2,4-dichlorobenzoyl)- 4-(2-methylbenzoyl)thiosemicarbazide (TA-18), and 1-(2,4-dichlorobenzoyl)-4-(4-nitrolbenzoyl)- thiosemicarbazide (TA-20) were found to possess anticancer activity equipotent or even stronger than that of reference drug – etoposide. In order to clarify the molecular mode of action of the mentioned compounds, the relaxation assay kit for human DNA topoisomerase II was used. It turned out that reduction of viability of cancer cells was a result of inhibition of human DNA topoII. 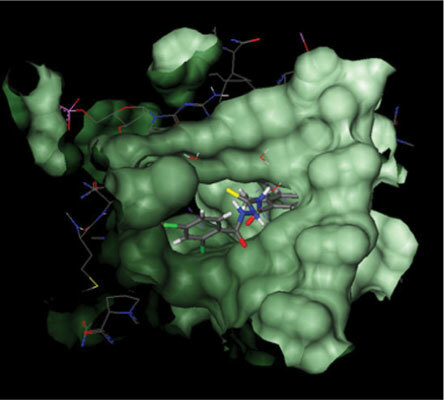 Molecular docking studies proved that 4-benzoyl-1-dichlorobenzoylthiosemicarbazides strongly interact with DNAdependent subunit of that enzyme. Human DNA topoisomerase, MTT assay, [3H]-thymidine incorporation assay, breast cancer cells head and neck squamous cell carcinomas (HNSCC).